Challenge yourself or your friends to solve a tile based jigsaw puzzle as fast as possible. This game will challenge your memory and time your performance. 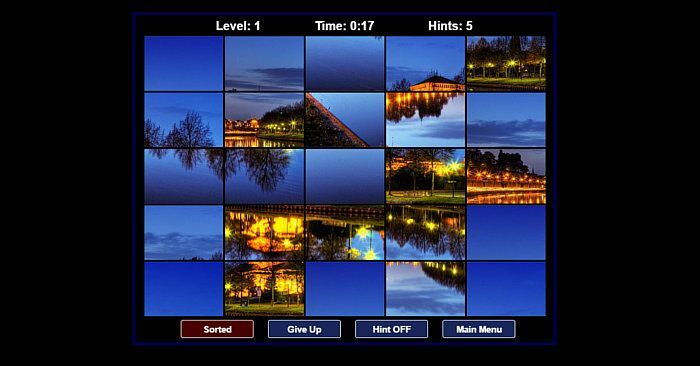 You can choose to use a self portrait (selfie) as the puzzle image using the built-in camera or select from many iconic and stunning places. There are 3 difficulty levels, Easy, Medium and Hard. It has been scientifically proven that playing logic and puzzle game help improve memory, neuroplasticity and IQ scores. This game is perfect to kill time at the office or at a boring meeting or just to improve your brain abilities. You can get this game from the Google Chrome App store for free or play it on the go on your mobile device. To play it on your phone or tablet, just go to the link below and on your browser menu, select "Add To Home Screen." is now brand name where you get all kind of games PC, PSP, XBOX. Torrentgams.net is website where you can downloadd all kind of torrent games which are 100% working. It is too much fun to play games at friv4school.com if you like to play free online games. However, friv4school.com is not suitable for those kids who are looking for learning games. I will suggest you a gaming website which is known as Learning Games for Kids to play these games. You can also visit cooler math games and also can go here for more games.